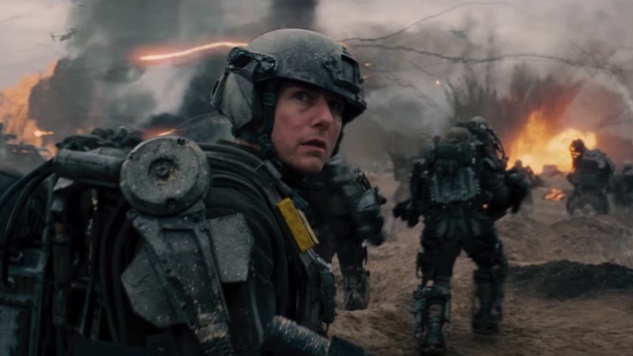 2014’s Edge of Tomorrow (aka Live.Die.Repeat) has walked a long and winding road to the recognition it deserves. The underrated sci-fi stunner—directed by Doug Liman, written by Christopher McQuarrie and Jez and John-Henry Butterworth based on Hiroshi Sakurazaka’s novel All You Need Is Kill, and starring Tom Cruise and Emily Blunt—disappointed at the U.S. box office, but has since been recognized as a diamond in the rough, one worthy of a follow-up. Just that was announced in the spring of 2016, but since then, the project has proven elusive—it would be another year before we’d find out the sequel’s title, Live Die Repeat and Repeat, or anything resembling a plot detail, like Liman’s revelation that Cruise and Blunt’s characters would be joined by “a third character … that’s gonna for sure steal the movie.” And since then, though Liman has kept the updates coming, concrete information on the sequel’s progress has been hard to come by, leaving us to wonder what kind of time loop Live Die Repeat and Repeat is trapped in. As of this week, we can ease up on wondering, if only a little bit: McQuarrie, who co-wrote the first film as aforementioned, shed some light on the sequel’s status while fielding fan questions on Twitter, revealing that Live Die Repeat and Repeat’s (as it may or may not still be titled) script—its second, after an initial draft was scrapped—is “in the works,” and that the project will only move forward given both studio script approval and actor/director availability. Edge of Tomorrow was an extremely pleasant, odds-defying surprise—it appears we’ll need a few more of those if Live Die Repeat and Repeat is going to make it out of preproduction limbo and into theaters, hearts and minds.